A billboard on U.S. 85 and 18th Street in Greeley, Colo., has residents upset on how the political billboard is depicting Native American. Two billboards that attempt to make the case for gun rights are being called disrespectful by some residents of a northern Colorado town. 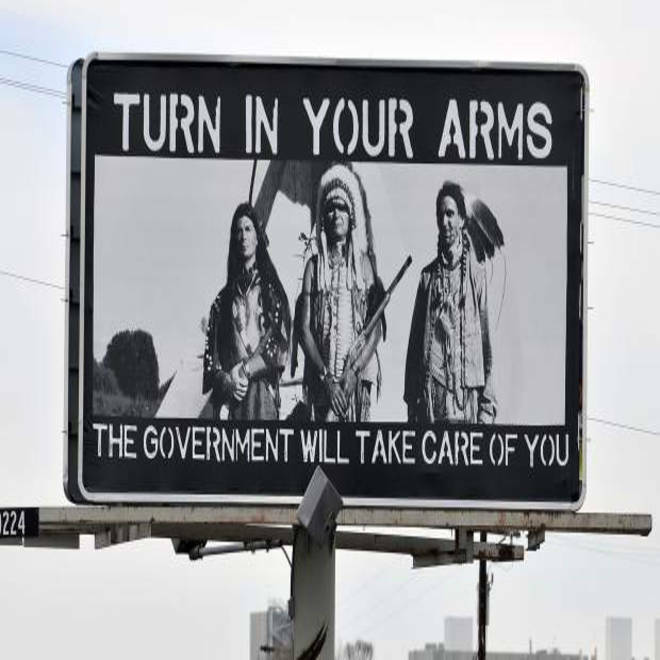 The black and white billboards, which are placed beside busy roadways in Greeley, Colo., feature three men dressed in traditional Native American attire with the words "Turn in your arms. The government will take care of you." The person in the front of the photo is holding a rifle. Matt Wells, and accountant with Lamar Advertising in Denver, told the Associated Press that a group of local residents who wish to remain anonymous purchased the space. "I think it's a little bit extreme, of course, but I think people are really worried about their gun rights and what liberties are going to be taken away," Wells told the Greeley Tribune. He refused to disclose how much the ads cost, but said they are only appearing around Greeley. He also said he has not personally received any complaints so far. But Irene Vernon, a Colorado State University professor and chairwoman of the ethnic studies department, told the Associated Press that the plight of Native Americans history with the U.S. is much more complicated than whether or not American Indians were armed. "It wasn't just about our guns," said Vernon, herself a Native American. Others who saw the billboard criticized it for politicizing or making light of the United States broken promised to Native Americans that date back to the country's founding. The story also lit up the Denver Post's comments section, with a strong amount of comments supporting the billboards. "I am a Navajo Indian and I am not offended by the billboard. The billboard merely points out broken promises by the U.S. government," said one comment. Others critiqued the ad's message, citing that the current debate about guns is not over whether or not existing gun owners need to turn their firearms in, but how to regulate how they are bought and sold. "If you feel you are putting out a strong message about gun control, why use a Native American image to make your gun-rights argument and then dastardly ask to remain anonymous?" another comment said.